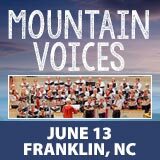 Mountain Voices is a community chorus with 70 members from Franklin and surrounding counties. The concert will include a variety of music: Broadway, pops, patriotic, folk and gospel. The chorus is accompanied by piano, brass, strings and other instruments. Come join us for a joyous musical evening!